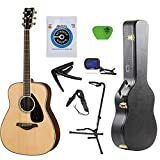 Yamaha F335 Guitar Review 2019 – is the Yamaha F335 acoustic guitar worth the money? Review of features, pricing, design, sound and more. The body style is dreadnought acoustic Top,laminate spruce Back. Yamaha has been manufacturing instruments for more than 60 years. With this level of experience behind the brand, Yamaha provides some of the most budget-friendly guitars. The Yamaha F335 Guitar is no exception. Being a budget guitar, the Yamaha F335 is solid but is definitely not the best constructed guitar available. Its spruce top is quite sturdy and not really porous but this could be because of the simple cut of the wood. If the wood is low in quality, it is less likely that a blemish will be detected. The Meranti sides provide this guitar with a nice touch; however, the cost is obvious. Although Meranti is not the most common wood, it is a cheap and has a plastic-like feel to it that could cause it to be unpleasant for some musicians. This is particularly true when the instrument is digging into the stomach while it is in use. The finish of the Yamaha F335 is definitely among its weakest points. The laminated coat gives the wood an almost unreal feel, which is not a good thing. The plastic feel is as a result of the manufacturer overcompensating for the poor quality wood with a large quantity of laminate. Rather than polishing a decent piece of wood, Yamaha took a bad cut and just filled in the many imperfections. Notes disappear while this guitar is being played. This is because laminated wood produces sounds that are inferior to real wood. With the Yamaha F335, notes become lost in the cloudiness of the laminate. Chords can be played; however, it is difficult to discern the notes even in simplest triads. Yamaha F335 is normally available in its slightly-aged, natural color but there are other varieties available as well. The Tobacco Brown Sunburst option gives the guitar a retro, rock-and-roll type of appearance. This color option is also available with a different kind of neck wood; it is made from Nato, not Meranti. It is also available in a solid black color, which gives it a kind of lustful aura and enigmatic feel. The material on the neck, Fretboard and top are left unaltered and the sound it produces is the same as the original. The F335 is a dreadnought-shaped guitar, which essentially describes the style of the guitar body. The shape was designed as a means of making acoustic guitars sound louder. This quickly became a favorite of bluegrass and folk musicians who are known for shouting over the sounds of their guitar; therefore, this feature was ideal for them. The F335 guitar is 1029 millimeter in length and 412 millimeter in width. It has a combination of woods and dimensions that are a constant throughout the entire Yamaha’s F series. It features Rosewood fingerboard, a laminated Spruce top and its sides and back are Meranti. In addition, it features a Tortoiseshell pickguard, which makes the guitar more visually appealing. Most of the reviews from users of the F335 have indicated that its best use is for practicing or jamming with friends. However, there are others who find it quite fitting for playing in small venues or a school band. The best feature of this guitar seems to be the ratio between its affordable price and its acceptable quality. Many find the guitar ideal for beginners or as a spare. The main qualities pointed out by users indicate that it has decent consistency, is fun to play, and it remains in tune. The price is also one of the high points of the guitar among its users. However, its overall quality is highly debatable among users. Many skilled guitarists describe the instrument as being toy-like and suitable for children. Others describe it as an instrument with a relatively decent feel but unacceptable audio and sustain quality. Some of the FG700S are “deluxe” in comparison to those of the F335. The top of the FG700S is made of solid Sitka spruce. This sounds slightly better than the F335’s laminated spruce. In addition, it is a standard for more expensive guitars. The sides and back are Nato and the fingerboard is Rosewood. It also has an attractive tortoiseshell pickguard. Perhaps the only edge the F335 has over the FG700S is the color availability. The FG700S only has a natural finish and a “Sandburst” finish that looks dark and poetic. Where the sound is concerned, the FG700S undoubtedly delivers a more smooth, precise and playful sound in comparison to the F335. The FG700s costs roughly twice as much as the F335. However, based on the amount of time you will be able to use it, despite how often you play it or how advanced you are, The FG700S is definitely worth the double price. The Yamaha F325D guitar bundle includes all that is needed to learn to master guitar playing. Constructed with Meranti sides and back and a spruce top, this guitar delivers playing ease and a remarkable sound, especially when compared to the F335. • Not really versatile as it can only be used for practicing, jamming and a few other practical uses. For the professional, the Yamaha F335 Guitar is just a toy or something to take on family camping trips. However, for the amateur guitarist, who has recently started on a quest of jamming, it is an ideal starting point. While this guitar is far from perfect, there are benefits to owning it as well. With its beautiful tobacco brown, black or natural finish, layout, versatility acceptable sound output and decent playability, this guitar is definitely worth a shot. Based upon feedback submitted by over 30 customers the Yamaha F335 Guitar has received an average 3.9 out of 5 star rating. We discuss why in this review article.